My mother always knew when I had people over because the house was always cleaner than when she left. That and she would find the one stray bottle cap under a curtain or couch or neighbor’s cat. and Mrs. Beasley was HAWT. Ha. I have never heard anyone say Mrs. Beasley was HAWT. I’m giggling like a school girl. Oh my god!! I just shared this with my entire office! That’s effing hysterical! I so needed this right now! Your dress is NOTHING like Mrs. Beasley’s… teenage boys don’t know from fashion! Isn’t there a rule somewhere that women must become the opposite of their mothers? ….um……..Denise? ……You WERE trying to look like Minnie, right? I loved your German, could you translate? he he I was one of your friends who had to shake out my things before coming into your house. Oh your mother is one of a kind! Thank God. You are by far the funniest person I’ve never met in person but know from Twitter. Your mom sounds like my mother. Only nicer. OMG! If anyone could make me laugh today, it would be you! That was hilarious. I will never think of dust the same way again. I hope I know you when you are 80 because I’m betting you will be a frakking laugh riot! (can’t wait to read your book btw – hope your sense of comedic timing is in there!) LMAO! Thank you Denise!! 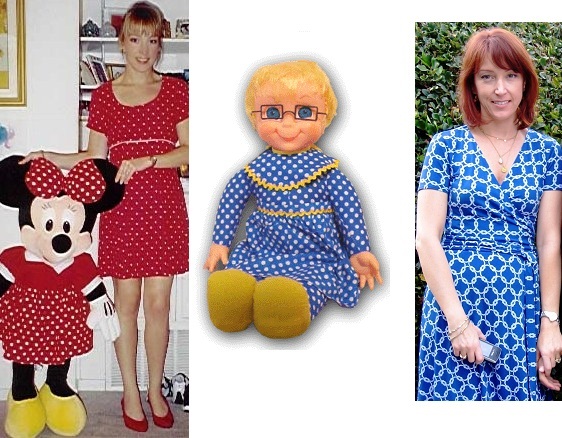 I still have my Mrs. Beasley doll. However she lost her glasses and has spikey rock star hair. Mine lost her glasses, no longer speaks, and has funky hair, too!